1. Turn off the power to your pool pump. Before beginning any work on the timer itself, be sure that you’ve turned off power for the pool pump at both the homes main circuit breaker and the breaker for the pump itself. Failure to do so could result in serious bodily harm. Simply open the circuit breaker and find the switch that controls the power to your pool pump and flip it to the off position. 2. Remove the shield covering the line and load wires. This will be located underneath the manual on/off lever for the timer. Simply take your screw driver and remove the shield so that you can gain access to the line and load wires. 3. Test the line and load wires to ensure there is no current running through the circuit. Take your multimeter, turn it on, and place your two test probes onto the connections for your line and load wires. If you’ve successfully turned off the power to the pump there should be no power being measured by your multimeter. However, if your multimeter is picking up power from the lines, STOP. Go back to the circuit breaker and be sure that you’ve turned the power off. 4. Disconnect the line and load wires from your old timer. Take your phillips-head screwdriver and loosen the screws that hold the line and load wires in place. You won’t have to remove the screws all the way, just enough so that you can remove them. You’ll want to remove these sets of wires one at a time, and once removed, take a piece of masking tape and wrap it around the wires. Then take a sharpie and label which set of wires it is (Line 1, Load 1, Line 2, Load 2). It’s important that you don’t get these confused when re-installing them into the new timer, otherwise it won’t work properly. Repeat this removal and labeling process for all the sets of wires. 5. Remove the timer from your pool pumps circuit box. Now that you’ve disconnected the line and load wires from the old timer you’r ready to remove the old timer itself. At the top of the timer there should be a little lever that you can compress, after it’s been compressed your timer should slide out of place. 6. Reconnect the line and load wires to the new timer. Now, take your line and load wires and re-attach them to the new timer. Take your time and double check that you’re installing the wires into appropriate spots. Simply loosen the screws with your screwdriver, slide the ends of the line or load wires into place and tighten the screw back down. 7. Push the new timer into place. Once you’ve attached all the line and load wires to their appropriate spot, compress the lever at the top of the box and slide the new timer into place. 8. Set the “on” and “off” intervals for your new timer. Now that your timer is all wired up and in place it’s time to set the intervals for your pool pump. We recommend that your pool pump should run for no more than 6 hours per day in total. If your local utility has “peak” and “non-peak” energy rates, we recommend that you run your pools pump during the non-peak hours since it will get your pool just as clean, but will end up costing you less in the long term. Simply take the trippers labeled “on” and “off” and align them at the desired times you’d like the pools pump to turn “on” and “off”. Once they’re lined up, all you have to do is tighten the screw until it’s finger tight. 9. Turn the power for the pool pump back on. Now that you’ve installed the new timer and set your “on” and “off” intervals for the pump go ahead and turn the power back. 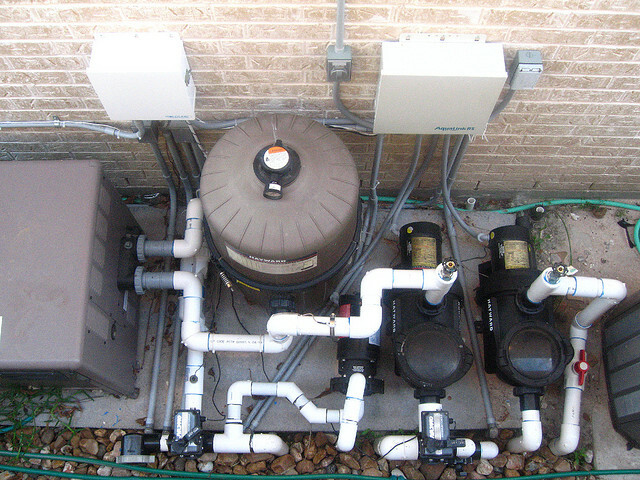 Start by turning the power back on at the main breaker first and the breaker for the pool pump itself second. Once the power has been turned on, go ahead and flip the timer to the on position. If you’ve installed your new timer correctly you should hear the pump turn on. Go ahead and turn the pump back to the off position and you’re all set. Your timer should turn the system back on once it hits the start of the “on” interval. If you’re looking for more ways to save money and energy around your home, be sure to check out our green home improvement projects: Green Living Ideas, after all, is a top 20 home improvement website!